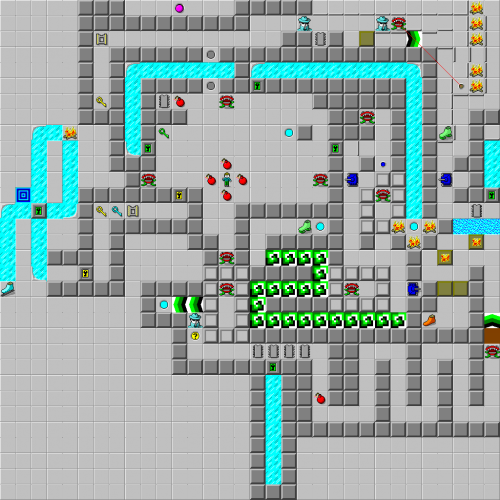 Teeth (CCLP2 level) - The Chip's Challenge Wiki - The Chip's Challenge Database that anyone can edit! When brushing teeth, use three up-and-down motions. This article is about CCLP2 level 119. For the monster with this name, see Teeth. Teeth is the 119th level in Chip's Challenge Level Pack 2. This specific level raises the study of teeth very high, similar to Paramecia in the same set by Eric Schmidt, and also includes a highly challenging blind labyrinth to put one of the teeth through. Odd step is very highly recommended, as it always saves Chip  in all situations. At the beginning, as three teeth explode three of the bombs, start immediately 2U to keep the fourth teeth alive, and use the green key to move into the ice slide which will cause the teeth to explode the bomb in front of the chip. 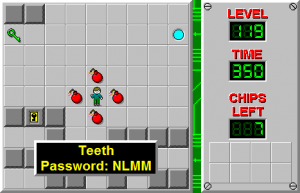 As Chip has to wait  to pass a square with an exploding bomb or disappearing water unless a monster passes the former, Teeth is impossible in Lynx. Use the green key again on the green lock slightly east, wait  and slide into the teleport, then go back and slide through again, and then open the other lock to the right side. Play through the hidden wall maze R 7D 3R D  3D, and now come the random force floors. Get to the suction boots as fast as Chip can; the maximum time that he can have when he touches them is 331.6. If Chip has an odd number of moves down on this, wait  before teleporting. In this new room, play into the green lock, then move  DU  D  D to "brush your teeth" as indicated in the hint; Chip only needs to do this two times, unlike the hint which indicates three. Continue out as the bomb explodes, follow the path through, turn down from the force floor and take the fire boots, and step onto the next green lock and wait [1 1/2] before sliding. This will cause the tanks to switch; follow the path to the suction boots, then just sneak past the teeth and take the last chip, then the yellow key behind the socket. Return back through the start area and open the yellow lock to lead to some keys and another green lock; move L to get the ice skates and skate up to the exit. If Chip picked up the suction boots at 331.2 with odd step, this route will score a time of 281, but the high level of luck involved in this has left that score unclaimed at this point. The total maximum in Teeth is 281.6 using odd step, as proven by Evan Dummit's derandomization tests. This page was last edited on 1 March 2019, at 03:41.